Meanwhile, it’s summer in New Zealand, so students have as much summer fun as they can. For example, this one student at the University of Auckland has just posted an ad that the Typical Student team just couldn’t pass by. A job description for a position of 'summer boyfriend' has been put on the notice board at Auckland University. Take a look! Surprisingly, you will find a lot of similarities between the viral ad and a typical job description. The recruitment specialist puts together a list of job requirements for candidates. However, in this case, the ideal candidate for the position of a ‘summer boyfriend’ must 'not white boy dance' and be a 'dog lover'. 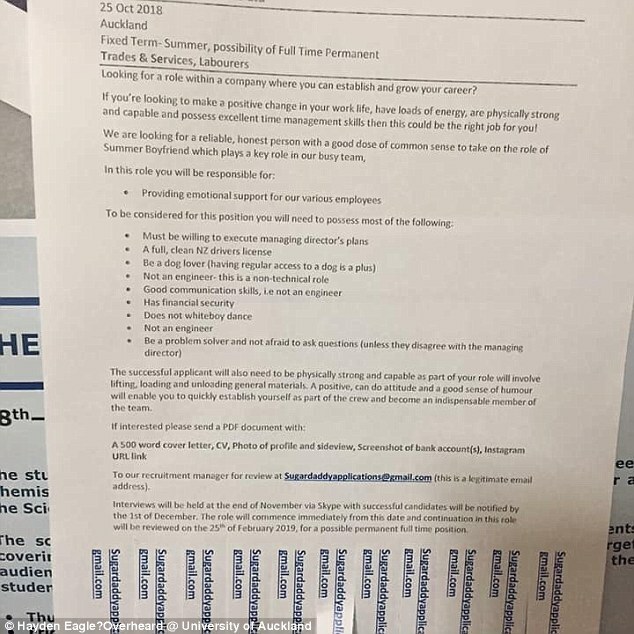 As told by DailyMail, the employer is allegedly $ugardaddyapplications Ltd. The ad starts with the line: 'Looking for a role within a company where you can establish and grow your career?' It follows a very strict list of job requirements for the suitable candidate. The employer said the ideal candidate will have 'a full, clean NZ drivers license' and be a 'dog lover.' So, all students wishing to land a summer job, must keep this in mind. As said in the ad, being a dog owner is a benefit. How Did Facebook Community React? The ad was also shared on the Auckland University Facebook page and amassed over 700 likes at the time of writing. Of course, the subscribers of the page went crazy over the ad, and specifically the recruiter's multiple swipes at engineers. Another user added: 'Hahaha would anecdotally rate engineers over lawyers but she can get in bloody line for good communication skills'.